Monarch butterflies aren't the only insects that hang around milkweed, their host plant. 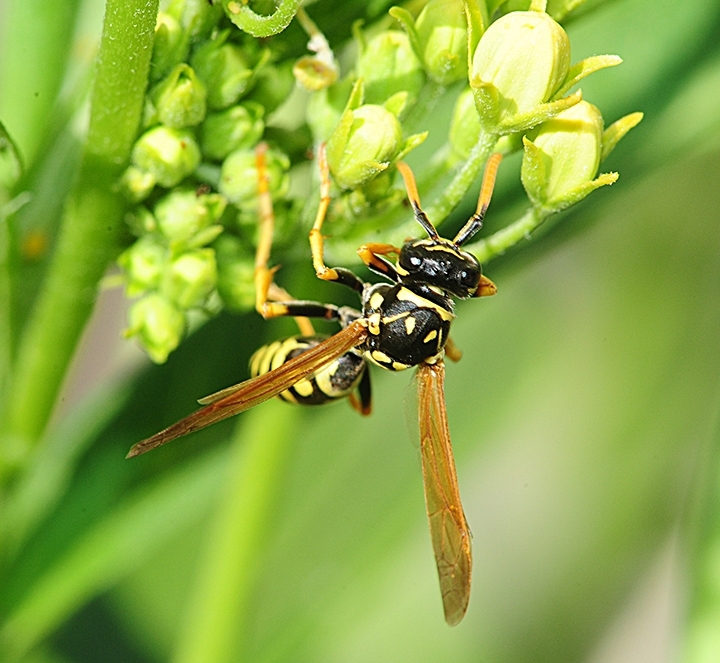 You're likely to see a variety of predators, such as the European paper wasp, Polistes dominula. This paper wasp is a little skittish around paparazzi so it helps to use a long macro lens, like a 105mm or a 200mm, that will allow you to get eye to eye, or nose to antennae. It's a meat eater, and a voracious one at that. We've seen it shred caterpillars and attack newly emerged butterflies. 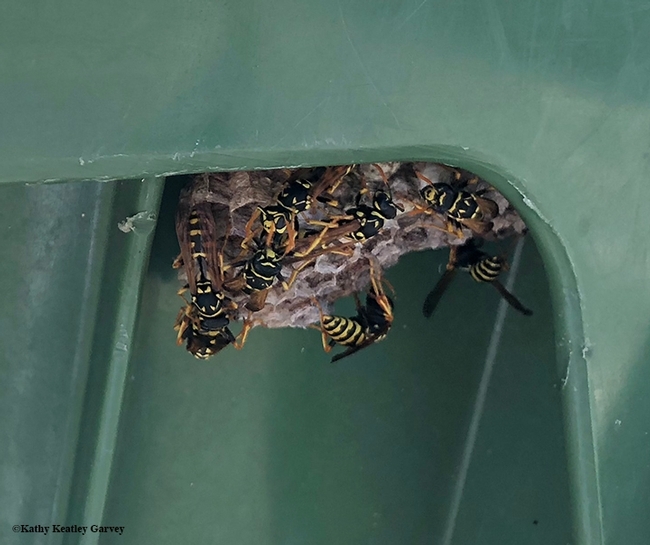 Unlike yellow jackets, "European paper wasps are not scavengers," says Lynn Kimsey, director of the Bohart Museum of Entomology and a professor of entomology at UC Davis. "They only take live insects, particularly caterpillars." Their menu also includes aphids. 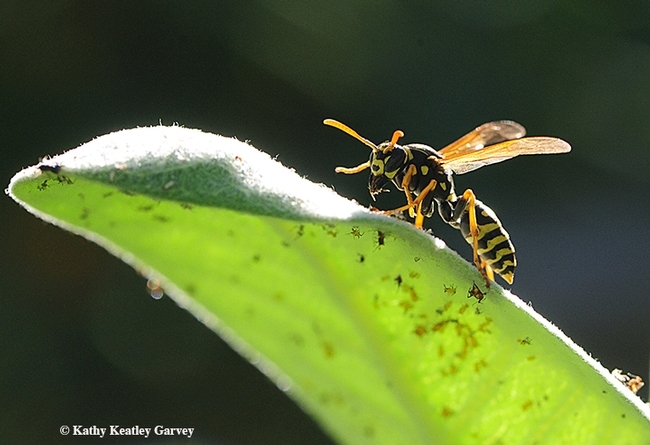 "For these wasps, meat is meat," Kimsey said. "Aphids are great because you get steak and dessert at the same time." And to that, we add: European paper wasps are quite photogenic--just don't move around like paparazzi. 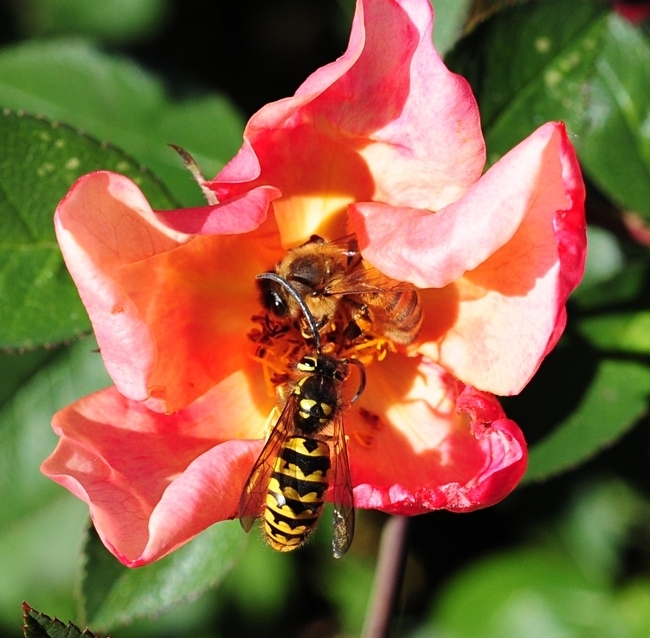 Western yellowjackets, nicknamed "meat bees" (as opposed to the "vegetarian honey bees") are often misidentified. 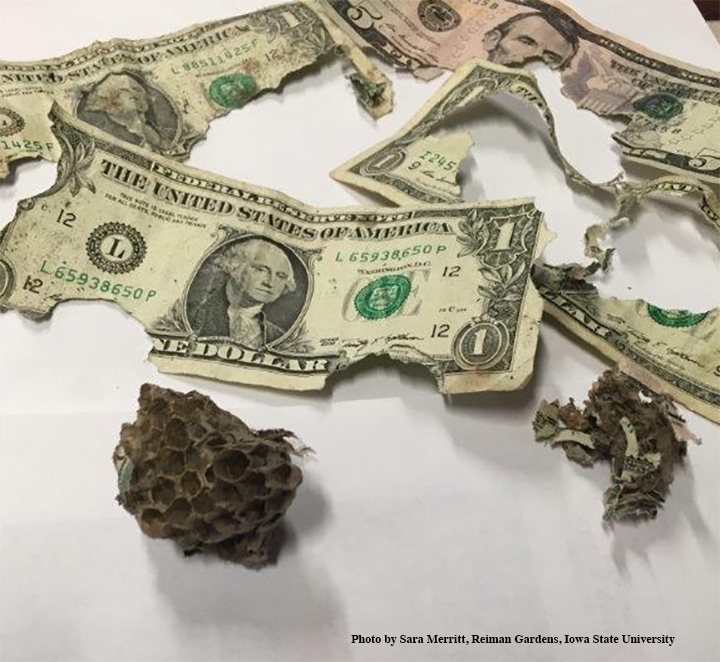 A recent visitor at a camp in the Sierra Nevada mountain range witnessed a large number of wasps and stinging behavior. They crowded around the picnic tables (ah, meat!) and sipped from soda cans (ah, sugar!) She wondered if they were yellowjackets or European paper wasps. From the description and behavior: yellowjackets. "European paper wasps (Polistes dominula) are not scavengers," says Lynn Kimsey, director of the Bohart Museum of Entomology and a professor of entomology at UC Davis. "They only take live insects, particularly caterpillars. 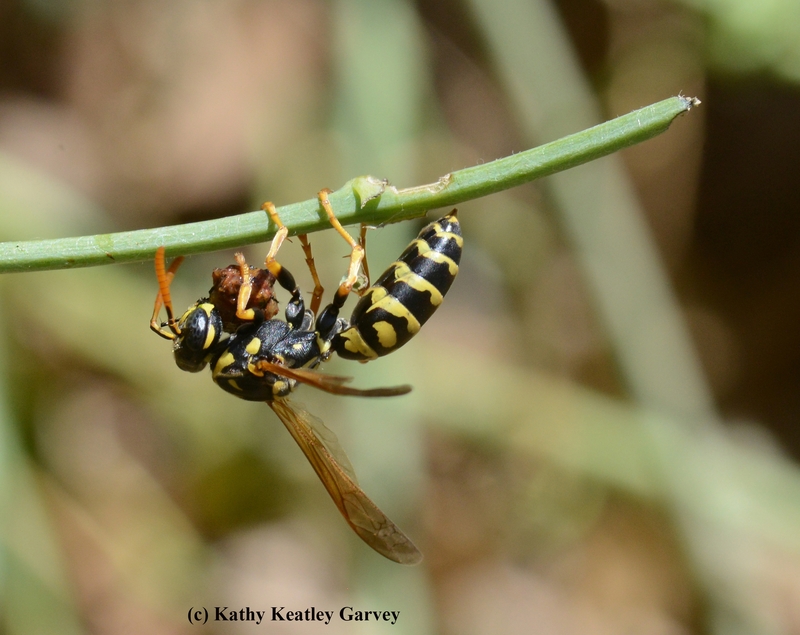 Western yellowjackets, Vespula pensylvanica, are serious scavengers and are major pests in the Sierra and elsewhere. Their colonies are annual, which means that fertilized new queens must overwinter in protected places until it warms enough in the spring to begin new colonies. As the new colonies are building they need a lot of protein for their babies. The larger the colonies get the more they need." "If many new queens survived the winter because temperatures were warmer and drier than usual then there will be many colonies to deal with, all competing for food. By late in the season the colonies go more into maintenance mode, needing a lot of sugar. 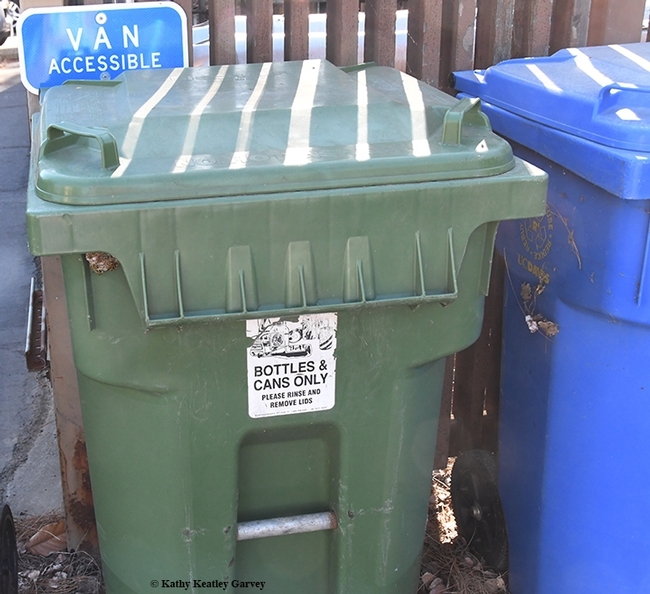 They aren't feeding many babies, which need protein, and the large number of adults need sugar for fuel." "At this point, control is largely useless," Kimsey says. "Control measures need to be started in the mid to late spring and the best control method is the use of baited traps, not spraying. Also when colonies are found they need to be removed--this needs to be done at night. These wasps nest in cavities, mostly in the ground but also in attics, wall voids and hollow trees if available. The large number of stings suggests that a colony or colonies were nearby." "So at this point it's best to hope for a long cold, wet winter," Kimsey says. 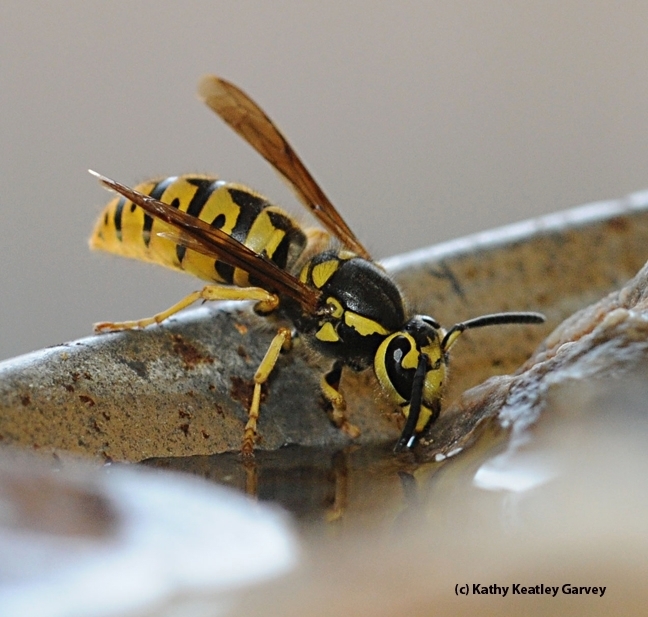 The UC Statewide Integrated Pest Management Program (UC IPM) provides a wealth of information on Western yellowjackets and paper wasps on its PestNote: "In Western states there are two distinct types of social wasps—yellowjackets and paper wasps. 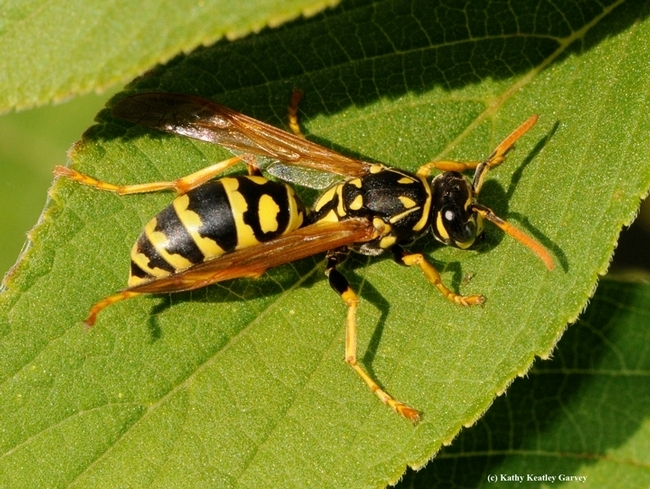 Yellowjackets are by far the most troublesome group, especially ground- and cavity-nesting ones such as the western yellowjacket, which tend to defend their nests vigorously when disturbed. Defensive behavior increases as the season progresses and colony populations become larger while food becomes scarcer. In fall, foraging yellowjackets are primarily scavengers, and they start to show up at picnics and barbecues, around garbage cans, at dishes of dog or cat food placed outside, and where ripe or overripe fruit are accessible. At certain times and places, the number of scavenger wasps can be quite large." "Paper wasps are much less defensive and rarely sting humans," according the to the UC IPM PestNote. "They tend to shy away from human activity except when their nests are located near doors, windows, or other high-traffic areas." 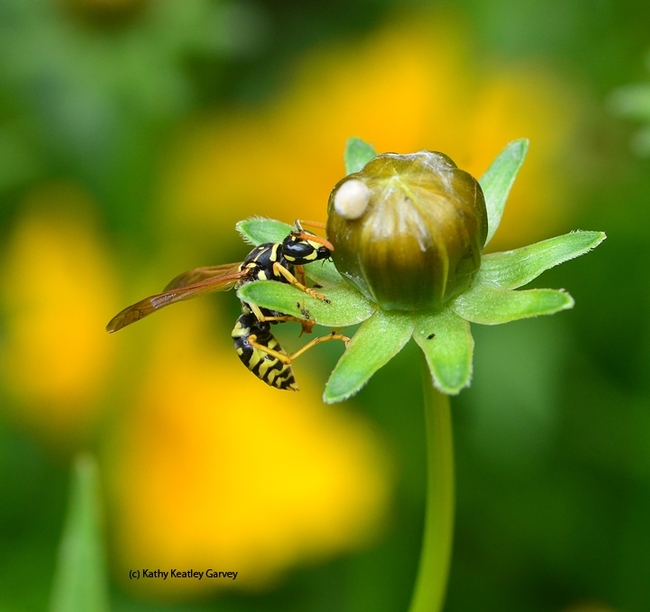 The UC IPM authors point out that "Typically, previously mated, overwintering yellowjacket and paper wasp queens begin their nests in spring when the weather becomes warm. The queen emerges in late winter to early spring to feed and start a new nest. From spring to midsummer, nests are in the growth phase, and larvae require large amounts of protein. Workers forage mainly for protein at this time—usually other insects—and for some sugars. By late summer, however, the colonies grow more slowly or cease growth and require large amounts of sugar to maintain the queen and workers; foraging wasps are particularly interested in sweet things at this time. 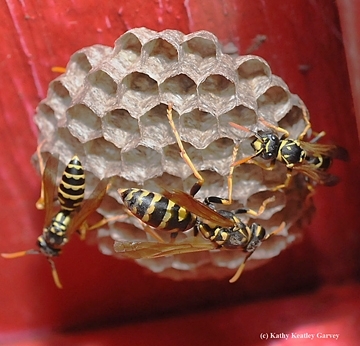 Normally, yellowjacket and paper wasp colonies live only one season. In very mild winters or in coastal California south of San Francisco, however, some yellowjacket colonies survive for several years and become quite large." UC IPM has posted an informative YouTube video, "Distinguishing Between Yellowjackets, Wasps, and Look Alikes." Look closely and you can see that those European paper wasps have distinctive orange antennae. Yellowjacket antennae are black. Or, to put it another way: Yellowjacket antennae are black, like the Oakland Raiders' logo, and European paper wasp antennae are orange, like the logo of the San Francisco Giants. So here's this cute little reddish/orangish caterpillar munching away on a passionflower vine. It's Sunday and he's having Sunday dinner--after having Sunday breakfast and lunch and snacks in between, thank you. He's on his way to becoming a Gulf Fritillary (Agraulis vanillae) butterfly. 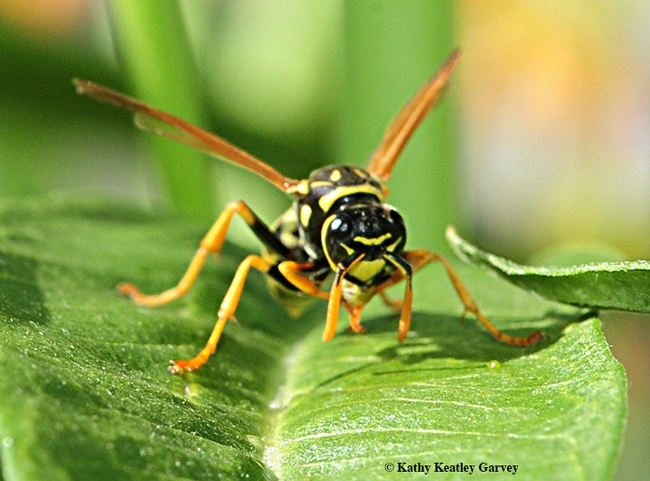 A European paper wasp, Polistes dominula, circles, attacks, and the non-battle is over within seconds. The caterpillar is defenseless. The wasp is hungry. There is not much left. 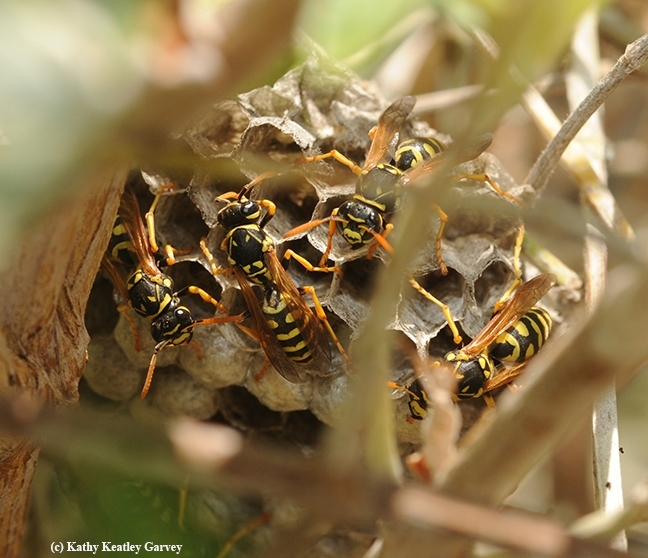 Indeed, there isn't much left when European paper wasps descend on a Gulf Fritillary population. They eat the eggs, the caterpillars, the chrysalids, and the adults, carrying food back to their colony. Protein. Predators. Predators with a Purpose. Do they attack adult butterflies? They do. 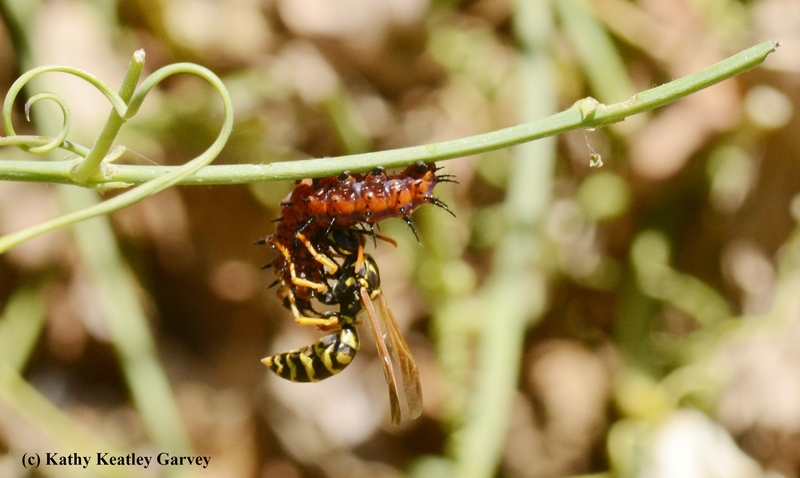 We recently shared one of our images of a European paper wasp (EPW) attacking an adult Gulf Frit; it appears in the current edition of the University of Wyoming's Barnyards and Backyards. See PDF. EPW is a relative newcomer to America. Native to the European and Asian continents, it was first discovered in the United States in the late 1970s and has spread throughout the country. It's often confused with the native yellowjacket. How can you easily distinguish them? The EPW's antennae are orange. 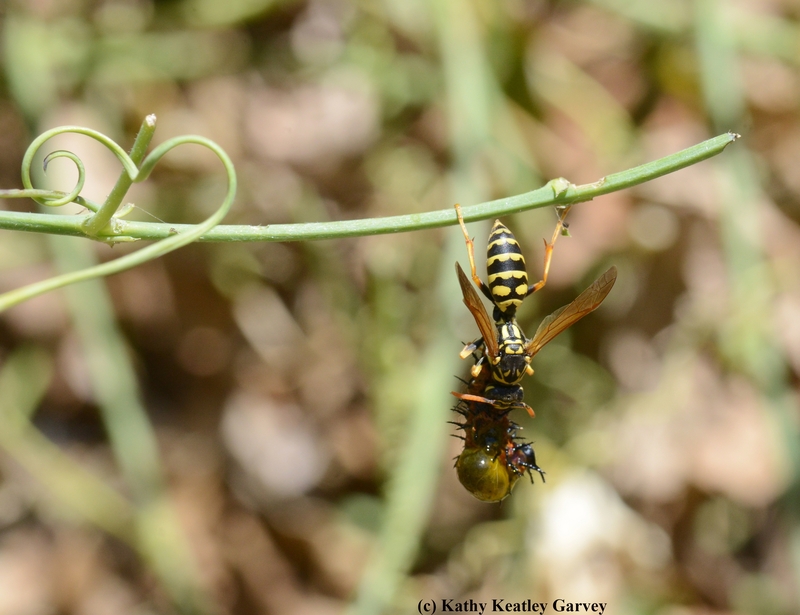 Entomologist Whitney Cranshaw of Colorado State University described the European paper wasp as a nuisance pest in a 2011 scientific article published in Southwestern Entomologist. In the abstract, he noted that it has "colonized much of Colorado during the past decade and has emerged as a dominant species of nuisance wasp. It is impacting many types of prey species, particularly larval Lepidoptera. However, in western Colorado it is also a common pest in fruit orchards and can be very damaging to ripening grapes, Vitis vinifera L.; sweet cherries, Prunus avium (L.) L.; and other thin-fleshed stone fruits. This latter habit is unusual for a Polistes species." The EPW is considered by many as a beneficial insect, especially when it targets the caterpillars of cabbage white butterflies, alfalfa butterflies and other pests. 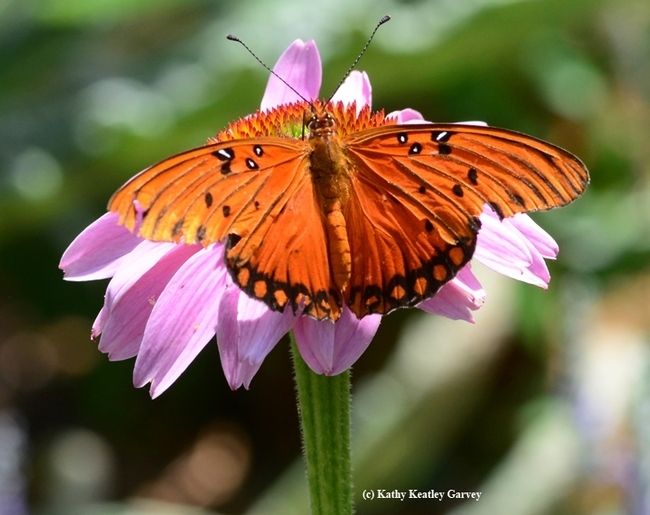 Butterfly enthusiasts are none too happy, though, when it preys upon the preferred butterflies, including monarchs, Western tiger swallowtails and Gulf Fritillaries. You don't hear those two words often, but you'll hear them often from Amy Toth, who's hoping that the hashtag, #wasplove, will draw attention to the wonderful world of wasps. 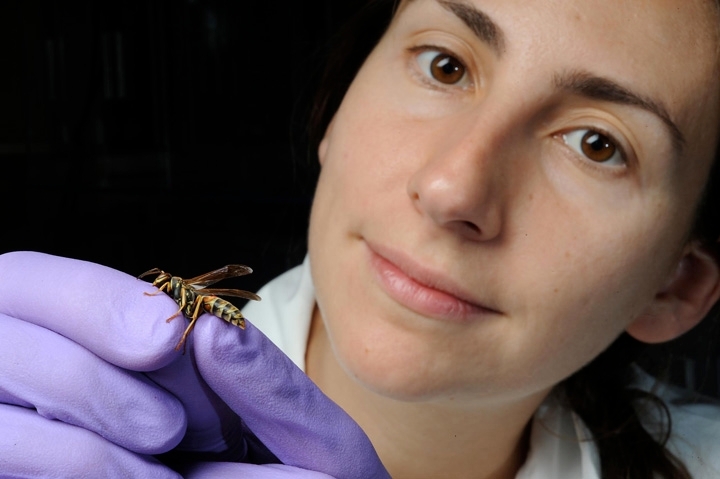 Toth, known for her work on bee and wasp behavior,genomics, and evolution, is an assistant professor--and outspoken wasp lover--from the Department of Ecology, Evolution and Organismal Biology, Iowa State University, Ames. 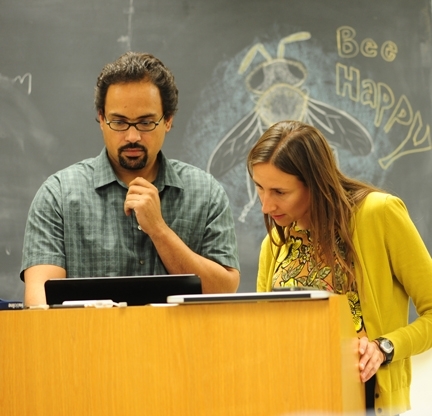 She delivered a presentation on honey bees at the UC Davis Bee Symposium on May 9. Then on May 13, she discussed her research on wasps at a UC Davis Department of Entomology and Nematology seminar. The Bee Symposium showcased a "lot of bee love," and she's hoping that the same love will apply to wasps. Indeed, folks verbally attack these social insects daily on social media. "I hate them," they say. "What good are they?" 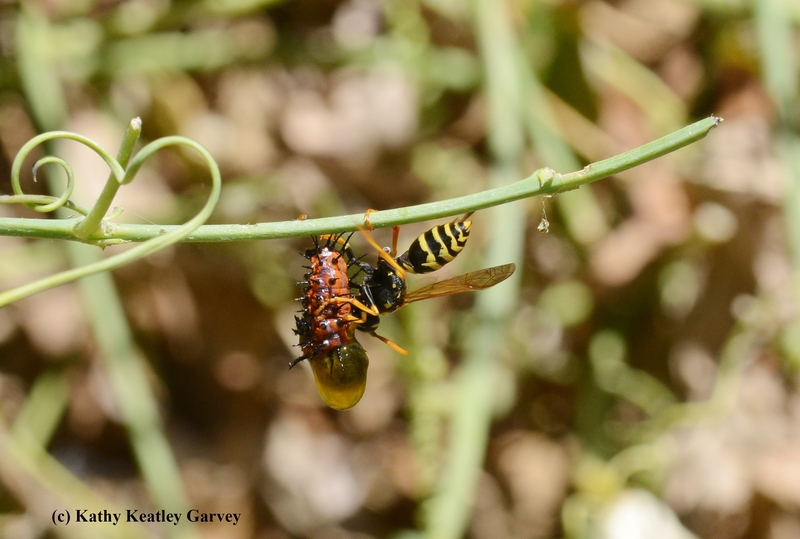 To be honest, I've witnessed European paper wasps (Polistes dominula) attacking crippled Gulf Fritillary butterflies in our bee garden, and dismembering and carrying off bits of Gulf Frit caterpillars to feed their colony. Wasps are carnivores. Honey bees are vegetarians. However, wasps are pollinators and they attack pests of agricultural crops, Toth told the Department of Entomology and Nematology at her seminar. Her audience nodded. So, we asked Amy Toth to list what she loves about wasps. 3. They have been shown to carry yeasts to winemaking grapes that may be important contributors to the fermentation process and wonderful flavors in wine! 4. They are the only known insect (Polistes fuscatus) that can recognize each other as individuals by their faces. 5. They are devoted mothers that will dote on their young all day long for weeks, defending their families with fury. 6. Their social behavior, in my opinion, is the most human-like of any insect. They know each other as individuals, and are great cooperators overall, but there is an undercurrent of selfishness to their behavior, manifest in nearly constant passive-aggressive interactions between individuals. 7. They are artists. They make perfect hexagonal nest cells out of paper, which they make themselves out of tree bark + saliva. 8. They are extremely intelligent. They're predators, architects, good navigators, and great learners. Among insects, they have large brains, especially the mushroom bodies (learning/memory and cognition area of insect brain). 9. They are beautiful, complex, and fascinating creatures! That's Amy Toth's amazing #wasplove list. I'd like to add No. 10: They are extremely photogenic. #wasplove! Think it will catch on?